Imaginary play with food is a common activity for kids. Whether they are making play food from dough, serving you on imaginary dishes, or "taking your order", we've watched our kids -- every kid -- go through a phase of being fascinated with food play. 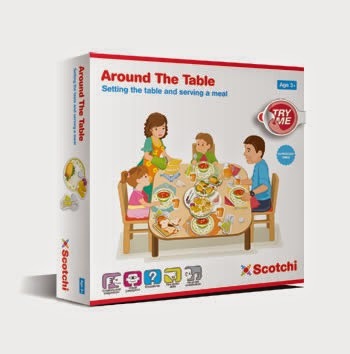 The Scotchi Around the Table Play Set really captivates kids in this phase. It is a durable cardboard set that includes a table, dishes, place settings, and food; all the pieces attach to the table and one another with velcro! The pieces themselves have a coating that keeps them protected during even the craziest play. (Which is good. Kids are always putting food toys in their mouth!) While designed for kids 3 and up (the pieces are small), the play set was enjoyed by both my 7-year-old and 3-year-old who played it together. There are many ways to use this set, although "free" play is probably the most fun. Parents can use it to talk about food groups, table manners, or even speech therapy scenarios. We like to have the kids ask us to pass them food -- since we struggle with little hands "reaching" over the table. Perfect for homeschool, daycare, or the family play room, the Scotchi set is just one of over a dozen similar sets that encourage fine motor skills, conversation, and active play. See all of them at the Scotchi website!